People ask us how to watch certain channels without cable all the time. Of these, the most popular stations typically involve watching sports without cable. These sports networks have a huge following and are one of the major factors that help people decide which streaming service is right for them. Although popular, sports aren’t for everyone. There’s no reason you should have to pay a premium to have local stations or channels like ESPN on your streaming service if you don’t plan to watch it. This is the entire foundation of Philo TV and is the reason they can offer such a polished streaming service so much cheaper than their competitors. What do I need to use Philo TV? Philo TV is a streaming service that offers live cable TV channels without a cable subscription. It’s similar to Netflix and Hulu, but offers live channels like HGTV, A&E, and History Channel, instead of on demand movies and shows. Like most streaming services, Philo TV has a low monthly fee, no hardware rentals, and no contract. It’s a way to eliminate your cable bill by reducing your channel lineup to content you actually want to watch. What makes Philo TV unique in the streaming industry is its minimalist approach to cord cutting. Most streaming services use sports and local stations as a way to entice users, but Philo takes the complete opposite approach and intentionally excludes them. These sports and local stations typically charge streaming services a lot of money to include them in their packages. In order to include them, services have to either sacrifice other stations or raise the price of their packages. By eliminating the more expensive stations, Philo can drastically reduce their price and offer channels that aren’t typically found in other bundle’s basic packages. At $16 per month, Philo TV is without a doubt the cheapest cord cutting option. It’s cheaper than even Sling’s cheapest package, and is less than half as much as Hulu with Live TV, YouTube TV, PlayStation Vue and DirecTV Now. Even if you’re looking for more channels than what Philo offers, its low price makes it ideal to get in conjunction with another service or an antenna. The most important thing you need to use Philo TV is an internet connection. You won’t be able to completely cut ties with your internet service provider, but taking cable off your bill should save you a lot. You’ve probably heard that cable “bundles” are cheaper than only having internet, but that simply isn’t true. With the rise of cord cutting and the ability to quickly compare pricing, standalone internet is cheaper and faster than its ever been. We wrote a full guide on how to get internet without cable that will walk you through the steps to find standalone internet you might not be aware of. The basic premise of the article is to use a database website that will let you compare local provider’s prices and speeds. This allows you to see some smaller internet providers and not be stuck in a constant battle of Xfinity versus Fios. The database site we recommend is Broadbandnow.com and it is a fantastic tool that will show you everything you need to know. 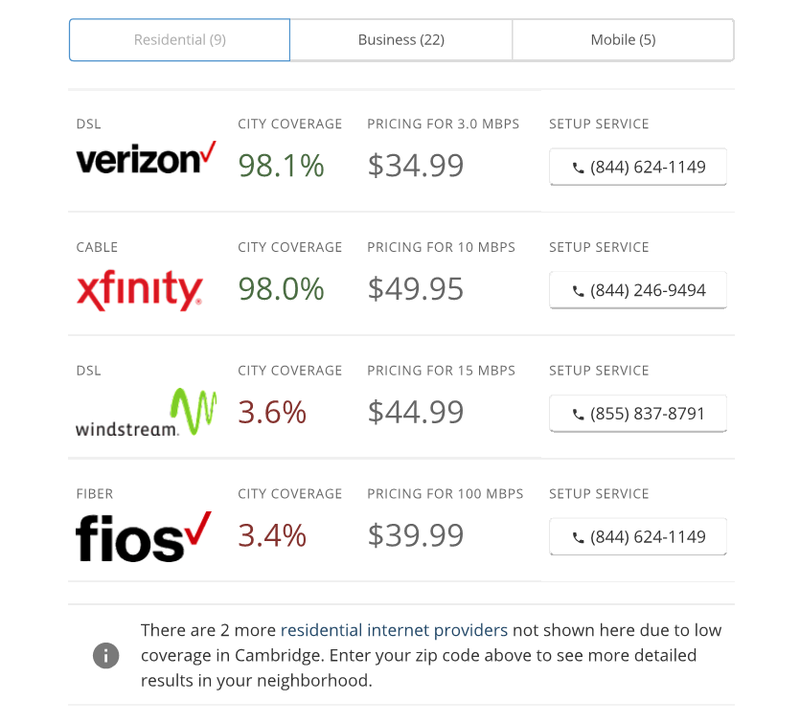 BroadbandNow‘s results for our Boston office’s internet options. In addition to internet, the only other major thing you need to use Philo is a streaming device. Unlike cable contracts, streaming services don’t provide you with hardware and then stick you with a monthly bill you for it. Instead, they develop apps that run on third party devices that can stream a variety of services. 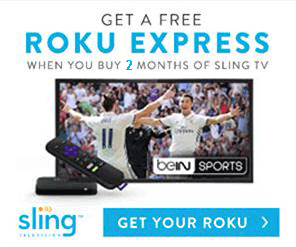 For example, one of the most popular and highly recommended devices is a Roku. 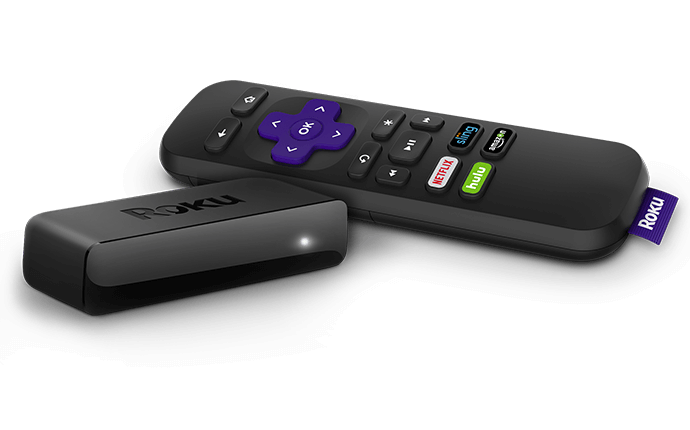 The basic Roku model costs $30 and will run almost every streaming service on the market. If you compare this to a monthly rental charge of $10 for a cable box, you can see how quickly this business model saves you money. Philo TV was launched as a college student’s cable alternative. It eventually grew beyond just college age kids, but its channel lineup is still reflective of its roots. The basic Philo package offers 43 channels and is appropriately named the 43 Channel Package. These channels include favorites like AMC, A&E, Discovery, HGTV, and Nickelodeon. If you’re interested in a specific channel that Philo TV carries, it’s almost impossible to find a cheaper way to stream it. Philo TV ranks number one in almost every one of our “How to watch _____ without cable” articles that features a channel the service carries. If Philo offers it, you can bet it’s the best deal. These include some of the most popular ones like HGTV and the Hallmark Channel. The image below shows the current full 43 Channels lineup that is available in all locations. Since Philo TV doesn’t offer any local stations, you can be sure that your channel lineup isn’t going to fluctuate. 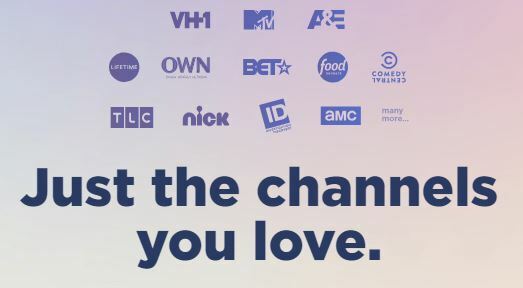 If you pay an extra $4 a month for their bigger package, you’ll add twleve more channels including the Cooking Channel, Destination America, and Nicktoons. As we’ve said above it’s important to note the channels that Philo TV excludes. Anything that plays sports content is expensive to offer and therefore not included in Philo’s channel lineup. This includes the major broadcast networks – ABC, CBS, FOX, and NBC as well as any channels owned by the same company (namely Disney channels). However, a lot of these can be picked up for free (legally!) with an antenna. 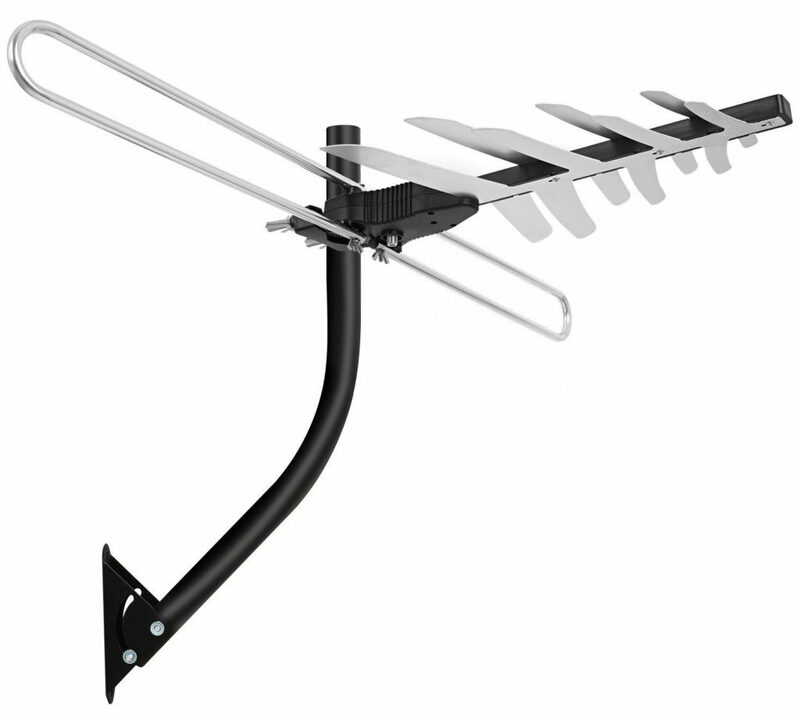 Antennas are a low, one-time expense that allows you to watch live cable TV channels for free. Combined with an antenna, Philo TV is an incredibly cheap way to replace cable without missing out on too many major stations. There are a lot of channels available over-the-air in the United States that are meant to be picked up with antennas. You might be picturing old rabbit ear antennas on top of a black and white TV and honestly, you wouldn’t be too far off. The concept of the indoor antenna hasn’t changed much, but the technology has. Most indoor antenna are a bit more stylish than rabbit ears and are way more reliable. One thing most people don’t realize is that the picture quality you get with an antenna is actually better than what you typically get with cable. Plus, it’s free! The list below shows the major channels that you might be able to pick up with an antenna. Some of the more notable channels on the list are the ones that are excluded from Philo. ABC, CBS, FOX, and NBC are all available over the air. However, this doesn’t necessarily mean you can pick them up at your location. Since the signals are literally broadcast over the air and have to be received by your antenna, location plays a huge role in channel quality and availability. Distance from towers, landscape, and even your house’s construction materials can have an impact on signals. Thankfully, there’s a quick way to check signal availability without playing too much guess and check. The best tool to do this is TVFool.com. When you click this link you’ll be brought to a form that you need to fill out. It’s mostly location information but also asks you for an antenna height. Try and input something as realistic as possible since height plays one of the biggest roles in picking up signals. If you’re not sure, just use 25′ for now. Look at colored table and find the Netwk column. It’s the fourth one from the left. Note the color of the row for each station that you’re interested in. This will give you a basic idea for the type of antenna you need. 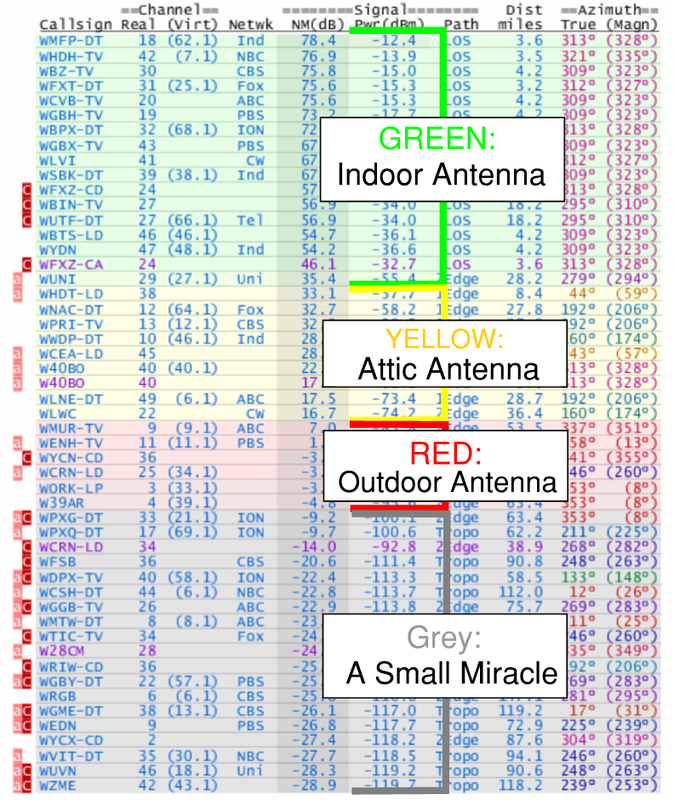 Take a look at our indoor antenna guide if your channels are mostly green with some yellow, or our attic antenna guide if you have a handful of yellow stations. These guides will show you our recommendations for antenna brands and models. Keep in mind that the image above isn’t the definitive guide for which stations you can pick up. It’s a good starting point, but additional factors (like the direction the signals come from) also matter. This type of additional information is included in your TVFool report and is explained in our guide that we mentioned above. DVRs are becoming less of a premium feature and more of a staple in the streaming world. Understanding this, Philo TV offers a free DVR with unlimited storage. Although unlimited, the stored content will only be saved for 30 days at which point it will be deleted. Unlike some services, like YouTube TV, the Philo DVR is a real DVR and doesn’t have limits for what you can skip. There’s nothing more frustrating than recording a show and not being able to skip the commercials. Another great feature that Philo includes is the ability to replay most content a few days after its aired; even if you didn’t record it. It’s sort of a playback feature that a lot of streaming services have started to offer recently. Almost every streaming service offers a free trial to test the waters before you cut cable. Philo’s trial lasts 7 days and only requires a mobile number to sign up. The number is only for identification purposes and allows you to try the service without having to enter a credit card. Most services require a card and auto-bill you for your first month once your trial is up. Philo TV is cheap and fantastic. It’s quite different than most of the other streaming services and provides a unique option for a lot people. It does make a lot of compromises in its channel lineup to remain so affordable, but that’s also the appeal. If Philo’s channel lineup isn’t everything you wanted, it’s low price makes it the perfect streaming service to use as an “add-on”. Since we like savings and “free” is a great price, we’re huge advocates for antennas. Since we already advocate purchasing an antenna to take advantage of over the air channels, Philo TV is a natural fit. It offers a lot of stations that antennas don’t which means you’re not overlapping channels and paying for content you’re already getting for free. In addition to using it with an antenna, we commonly recommend Philo TV as a supplement to other streaming services. For example, PlayStation Vue doesn’t carry the incredibly popular kid’s stations Nick, or Nick Jr. Rather than recommend another more expensive service that might not fit as well, we tell people to add Philo TV. The only issue with running multiple services is that it can be a slight pain to have to swap services to watch certain stations. Due to Philo’s small package size and the inevitable overlap between services, it’s not impossible to remember which stations you need to swap to Philo to watch, it’s just annoying. The money saved is definitely worth the frustration, but it’s something you should be aware of. The biggest problem with considering Philo TV an “add-on” service and combining it with a second service, is that it doesn’t have as deep a pool of supported devices as a lot of its competitors. If you’re intending to use Philo in conjunction with something else, it doesn’t make a lot of sense to have to buy a second device just to support it. However, they have recently added Roku and have plans to continue adding popular devices. If you currently own an Amazon Fire TV or an Apple TV, make sure to add in the cost of a new device before deciding if Philo is right for you. Philo TV is a huge step in the right direction for cord cutting and brings us closer to true “al la carte” TV. If more services added smaller and cheaper packages, you would be able to build your own streaming service and not waste any money on content. Licensing deals and partnerships prevent that, but Philo is trying to circumvent them by excluding those types of channels. Philo can’t help you if you’re looking for ABC or ESPN without cable, but if you want a small package with a small price tag, Philo TV is hard to beat.